It is a matter of Great Pleasure that Police Housing Corporation has received that the first GREEN BUILDING AWARD in Maharashtra for this project. The work of Construction of PTS Tasgaon, Sangli has registered for Green Star rating from TERI (The Energy & Research Institute) - GRIHA (Green rating for Intergrated Habitate Assessment) for star rating as per their norms under Ministry of New & Renewable Energy Gov. of India. TERI GRIHA has evaluated all 35 points. Also, Shri. Shiva Kishan CEO, GRIHA & Smt. Neha Arora, Project Officer, GRIHA visited the site to check the facts on site. After evaluation of each point Association for Development and research of sustainable institute (Adarsha) awarded the Four Star rating under GRIHA. (Green rating for Integrated Habitat Assessment) The National rating system for green building in India Habitats of Minister of New & Renewable Energy, Govt. of India to the work of construction of PTS Tasgaon. This project has been further qualified for MNRE incentives. The campus is the first green campus project in the country having star rating. 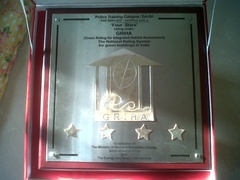 PHC has received the award plaque of 4 star rating on 7th Jan 2011 at Delhi from Shri.Farauk Abddullah Hon. Minister of New & Renewable Energy, Govt. of India.